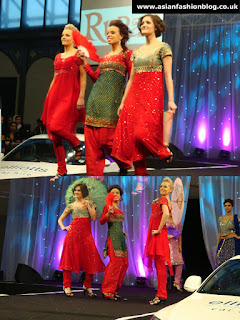 Rupali were next up on the catwalk at the Asian Lifestyle Wedding and Fashion exhibition in Manchester. They have 3 stores in the UK, in Bolton, Leicester and London and also have a mail order and online store. I like the blue/grey suit best out of these 3. It's not a typical colour and you could almost go as far as calling it a "dull" colour but the gold embroidery gives it that sparkle. The other blue suit is nothing we haven't all seen before, and the pink suit is pretty in a sickly-sweet kind of way but to be honest I'm a bit over pink suits at the moment! What do you think of these two long dresses? I'm not entirely convinced, maybe it's because your most typical asian outfits come in 2 (or more) pieces that these 1-piece outfits look a bit unusual. Or it could be that these dresses aren't fitted perfectly to the models? 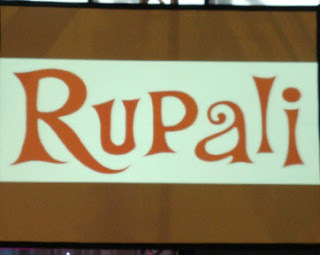 That was all from Rupali, you can visit their website here although I couldn't find any outfits from the show on their site so they evidently have more stock in store! 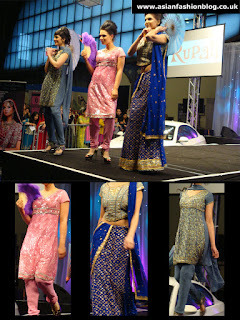 Also check out the video of the Rupali show from youtube. 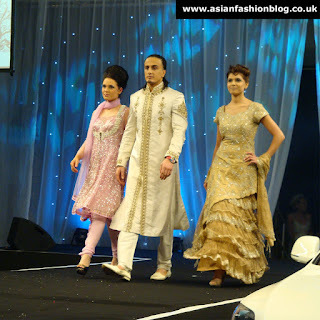 The Asian Lifestyle Wedding and Fashion Exhibition took place in Manchester at the end of February. 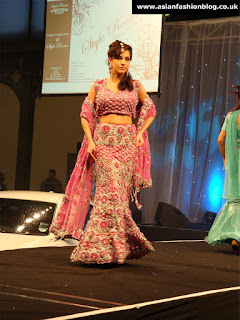 I attended the event, which I have to say wasn't anywhere as glamourous and glitzy as some of the other wedding and fashion exhibitions I've attended (namely the Asiana Magazine shows) but nonetheless it was a good chance to check out what the northwest has to offer in the way of fashion and bridal services. I of course got myself into a prime position for the catwalk show so without further ado let's start with the collection from Style Rooms. 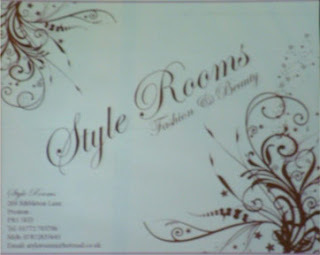 Style Rooms are based in Peston, I've never actually visited their store, so can't point anyone in their direction and surprise surprise they don't have a website either! If anyone has their actual location or contact details feel free to post in the "comments" section at the end. The collection was dominated by pinks. Of these outfits above, I think the first was a bit too heavily embroidered, it almost looks like it's weighing the model down. 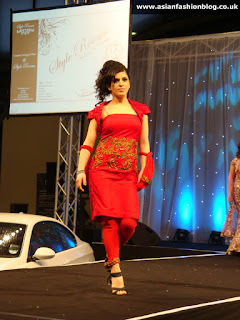 The second outfit has that balance of being embroidered all over but having a more light-weight feel. I'm not entirely sure what to make of the third outfit, it would be good to have seen the way the skirt falls naturally as I can't imagine someone in real life walking around holding their skirt up like that! 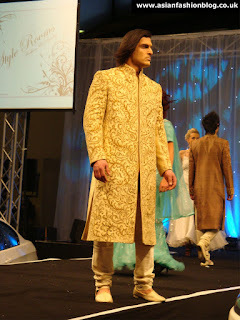 Finally, there was a churidar suit, these are still very much being worn. I've never been a fan of long sleeves, but the sheer sleeves on this outfit fit in with the sheer cut-out at the back (which I didn't manage to get a photo of!). 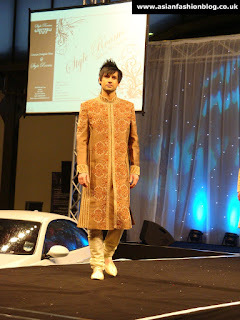 The collection also showcased some menswear. None of the mens outfits really stand out to me, but if you need to buy some menswear while you're out shopping for yourself then they have it! 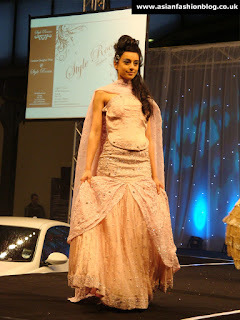 It really stood out compared to the pinks and pastels on the catwalk. I like how it's so simple with only a band of embroidery in the middle, and the bolero jacket looks fab and makes the outfit quite versatile in terms of switching between sleeveless and covering up.